Parents, Kids and Bullying Behaviors – What Can We Do? “You’re a horrible person,” was what I heard and deeply felt though I cannot recall the exact words that delivered this final crushing blow. It had come after a series of unconsidered and callous jabs and was interspersed with racial jokes directed at others that were, in part, responsible for the double crease lines between my eyebrows. This clearly was not my circle of friends though they had been the first and only ones I knew in an unfamiliar school in an unfamiliar community. And after many tears, my Mom had me convinced that the only way to deal with this hurtful situation was for me to screw up my courage and directly confront the girl of many mean words. And my Mom was right. Though it may have been the hardest thing I had done in my tender fourteen years of life, it was the most courageous and empowering. I took control of my relationships. I called her on the phone requiring the safety of distance and invisibility. I told her she had been cruel and she knew it. I wouldn’t take it anymore. “Just stop,” I said. And that was it. I’m not sure I muttered another word to her the rest of my high school years nor she me. And I was not only freed by getting rid of her presence in my life, but I felt a new sense of agency. I could face meanness and come away standing tall. Most, at some point in their lives, have been bullied. Someone has intentionally caused them harm, emotionally and sometimes, physically, repeatedly over time creating a dominance of one over another. Immunity cannot be guaranteed for anyone but there are clear, research-based steps parents can take to prevent their own children from choosing bullying behaviors and also, from being the recipient of bullying. If you think your child has not experienced bullying, consider that in a study of U.S. students, grades 3-12, fewer than half said they had told a parent about their experience.1. So look for signs. If your child has repeated tummy aches and doesn’t want to go to school, ask if there are troubles they want to avoid. If your child seems depressed and you are unsure why, spend time hanging out together and just listening. Your demonstration of openness and trust may raise the subject that might otherwise remain a secret. – parents are aggressive, punishing and emphasize power and dominance in the family. – siblings are aggressive with one another and parents allow it. – there is physical and/or emotional abuse in the family. – parents are overly permissive and/or ignore their child. Parents who are consistent with boundaries and limits and balance it with responsiveness to needs and clear love and attention are significantly less likely to perpetuate bullying behaviors. 2. As with any social and emotional skill or lack thereof, family values and models are the greatest teachers. Become aware of your own language. When speaking about others, do you use language that includes labeling or demeaning words? Do you ever label your own child? You may feel that calling him a “geek” is innocent enough but what if the teacher called reporting your child was calling others “geeks”? Check your own language as you speak and realize that your child is learning from you. I ask myself, “If my child repeated what I am saying to someone else in public, would I be upset?” If my answer is yes, then I rethink and rephrase what I am saying or I try to not say it at all. Be your child’s advocate. Perhaps you are not aggressive with your children but a relative is. Don’t allow it. Don’t allow uncles, aunts or grandmothers to criticize your child. There are kind and firm ways you can advocate without hurting others’ feelings. Remove your child. Change the subject. Distract with a game or other plaything. Pull the offending adult aside and ask them politely but firmly to stop. If you suspect they are inappropriate with your child when you are not present, make certain they are not left alone with him/her so that there are not opportunities for mistreatment. Cultivate sibling kindness. If a family culture helps determine each child’s behavioral choices, then there needs to be certain limits between and among siblings. Harm whether physical or emotional is not acceptable. If harm is caused, parents can direct children in ways to make up for their harm – fixing a broken toy or doing a kindness for a sister with hurt feelings. Promote and practice sibling kindness by creating chances for siblings to appreciate one another. At dinnertime ask, “What did you notice your sister do today that was kind?” Also, find chances to guide siblings toward cooperation (versus competition). Siblings who are able to work together get regular practice in being collaborative and will translate that practice into their school relationships. Learn strategies that prompt responsibility instead of resorting to yelling and/or punishment. If you are reading this blog, you are on a positive learning track as a parent! We all need support in our roles doing the hardest, most important job on the planet. Know how you learn best and seek ways to continue your own learning. Parents who understand multiple strategies for responding to misbehaviors don’t need to resort to yelling or punishment. They retain (or regain) their own emotional control and use those moments to teach their children responsible behaviors. 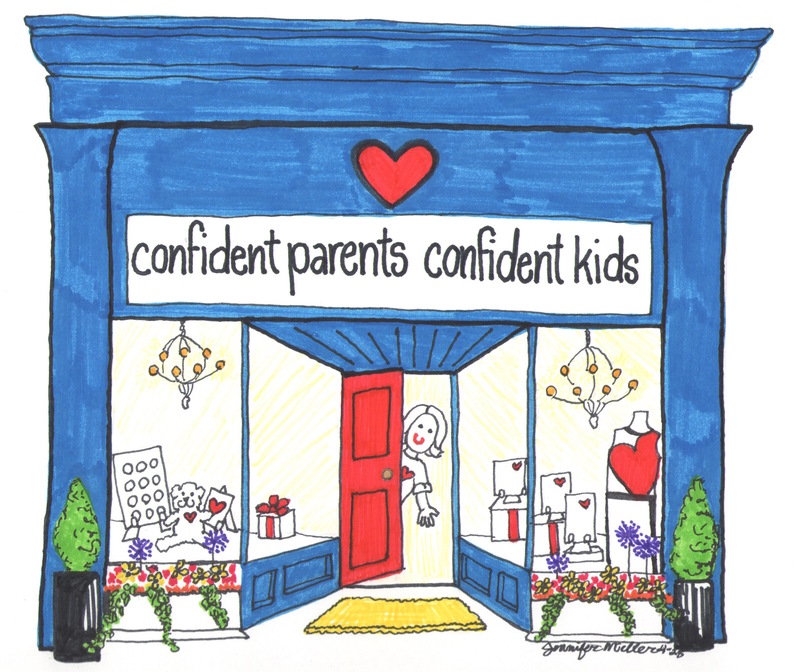 Mom’s Clubs, support forums, parenting education classes, online webinars (see Confident Parents Academy), articles and talking with parents you admire are all ways to advance your own abilities in this area. Practice social and emotional skills. Whether you engage in cooperative games with your family or hold family meetings to dialogue through problems, find ways to practice social and emotional skill building at home. 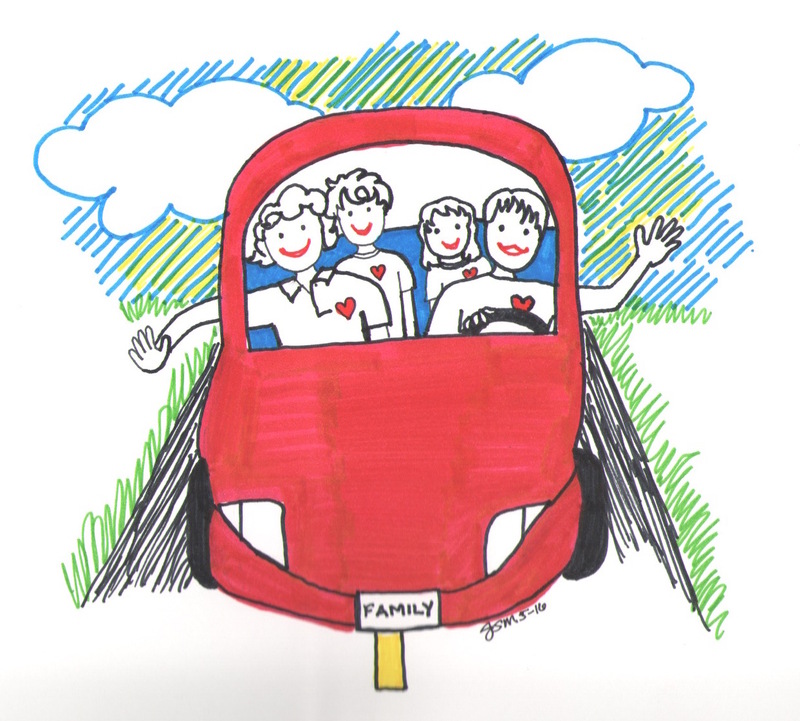 Instead of running to help a neighbor on your own when Mom or Dad gets home to watch the kids, take the kids with you. Let them experience empathy in action. Find ways they can contribute to your home, school and community. Children who have practice in social and emotional skills do not need to bully. They derive power from their own skills and abilities. Listen with compassion and leave judgements behind. If you create sacred space and focused attention in which you listen to your child regularly, he is much more likely to share his troubles with you. If you learn he is being bullied, listen to the full story with compassion before chiming in. Express empathy for your child who is hurting. Also, be clear with your child that the other – the one who is choosing bullying behaviors – is hurting in ways we cannot fully understand. But what they are doing is not right and needs to stop. Show confidence that your child can respond. Though painful, responding to bullying attacks is an important opportunity for your child’s growth in her social relationships if you provide support. If you give her the tools to deal with her own relationship problems, she will grow in her confidence and gain invaluable experience she will certainly use later in life when confronted with other difficult behaviors. Coach your child on how to react. Because bullying behaviors are defined as a series of mistreatments, there tends to be a continuation and often an escalation of attacks over time. That means that the best time to address bullying is immediately. Coach your child on ways to respond the next time they are attacked. If a classmate says, “You are so ugly,” for example, practice what your child would say and how they would say it. The best responses follow this criteria. What is said is short, memorable and well-rehearsed. 2. Child communicates what is happening is wrong. 3. Child communicates that it must stop. “You are so ugly,” says attacker. “Gina, stop it. You know you are wrong.” says your child. How a child says it – his body language – is as important as what he says. He will be scared. Acknowledge that anyone would be but that doesn’t mean he can’t do it. In fact, he can. Practice standing up straight. Looking the attacker in the eyes. Say his few words – “You are wrong. 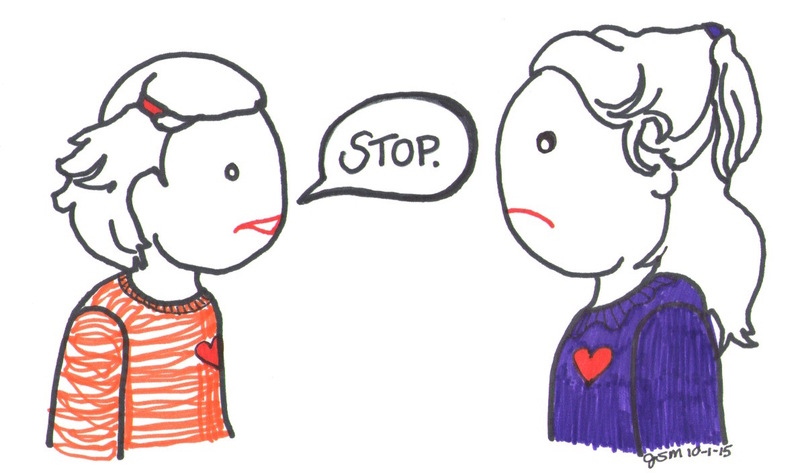 Stop!” firmly but not yelling (yelling indicates a loss of emotional control). Then, walk away. Like ripping off a bandaid, the interaction only need last a few minutes but can have lasting impact on your child’s confidence. You can also coach your child to proactively confront their attacker as my Mom did with me. Give your child the choice. I was so upset that I needed to take control right away and not wait for another attack. Your child may have more courage to respond if he practices and then goes to his attacker and communicates that things are going to change. 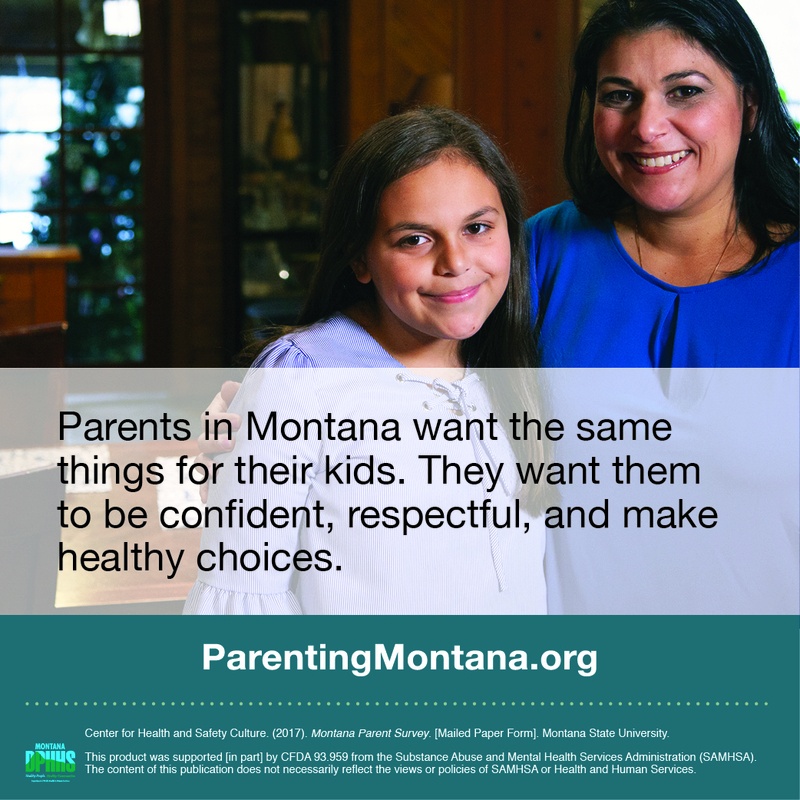 Either way, your child is empowered with the tools to shape his/her own relationships. DO NOT encourage your child to engage in any hurtful word exchange. And DO NOT model it inadvertently by criticizing the attacker. 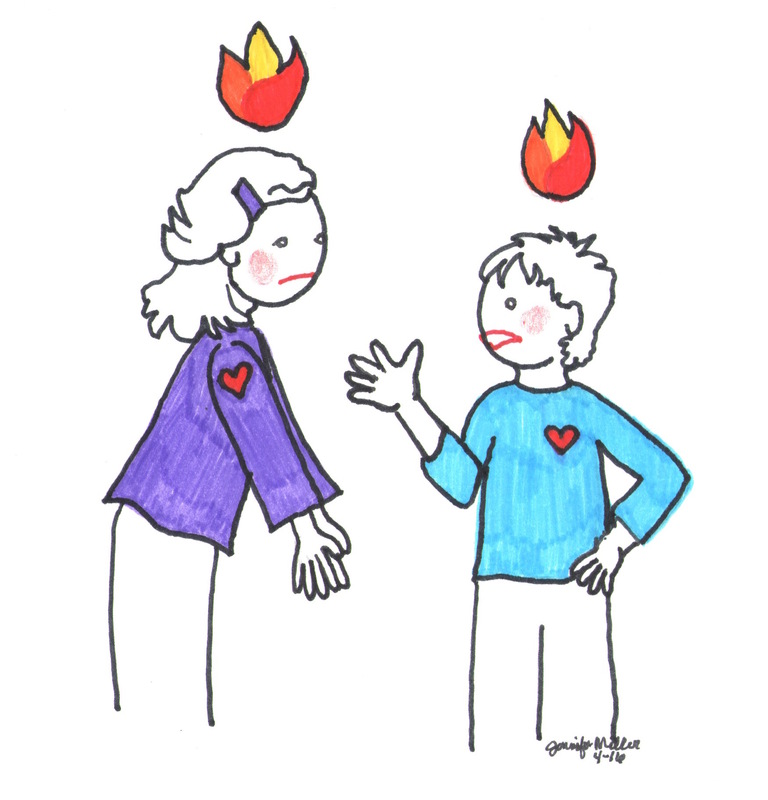 A hurtful retort (referencing character, calling names) could escalate the conflict and put your child in immediate danger. Hold back on your own comments even if they are flying through your mind and keep your child safe. Evidence-based school-wide initiatives that promote a caring school community and allow students to practice social and emotional skills have been found to be the most effective in preventing bullying. Specifically a meta-analysis of studies found that the most effective bullying prevention programs in schools included parent training, improved playground supervision, multiple disciplinary strategies (not Zero Tolerance), school conferences or assemblies that raised awareness of the problem, classroom rules against bullying, classroom management techniques for detecting and dealing with bullying and the work of peers to help combat bullying. 3. Check out the CASEL Guide on Social and Emotional Learning and Bullying Prevention for more. So what can we do as parents? Find out what is being done in your child’s school. Ask what programs, policies and practices are in place related to bullying prevention. Raise your own awareness and let your family know about the school’s efforts. Get involved. Does your school’s Parent Teacher Association have a role in bullying prevention? Get a seat at the table and make sure that it does. In my own state of Ohio, I worked closely with a parent who had been bullied as a child. She brought up the issue and her advocacy and persistence resulted in the adoption of a state-wide policy through the Ohio Parent Teacher Association on social and emotional learning and bullying prevention. Parents do have a powerful voice if they use it. 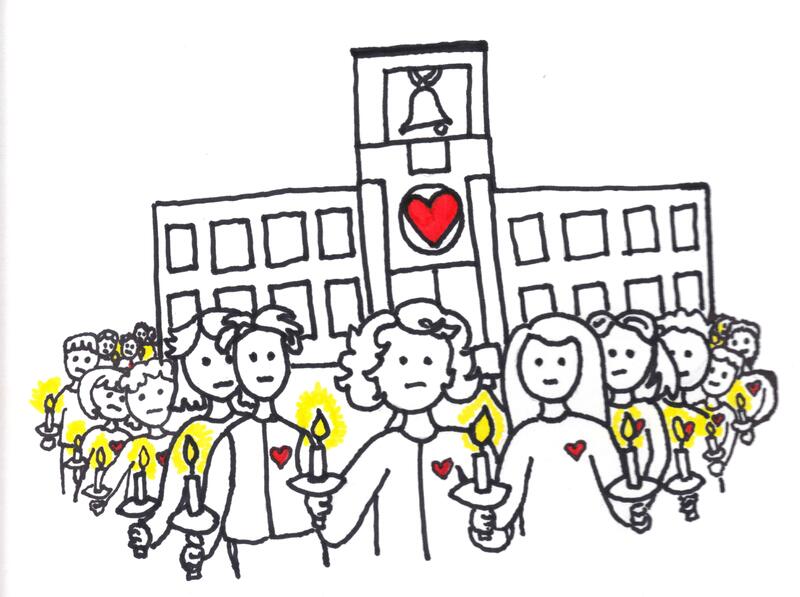 The schools who have dealt with school shootings have, after the tragedy, adopted a focus on creating a caring school environment and involving parents in that process. Don’t wait until your child’s safety is at risk. EVERY school needs to have plans and practices in place to promote connectedness between all members of the school community. Promote Upstanders. Upstanders are kids who witness bullying behaviors and stand up for the kids who are being picked on. Some schools promote this as a part of their caring culture. Classroom discussions include conversations about how you can stand up for others. 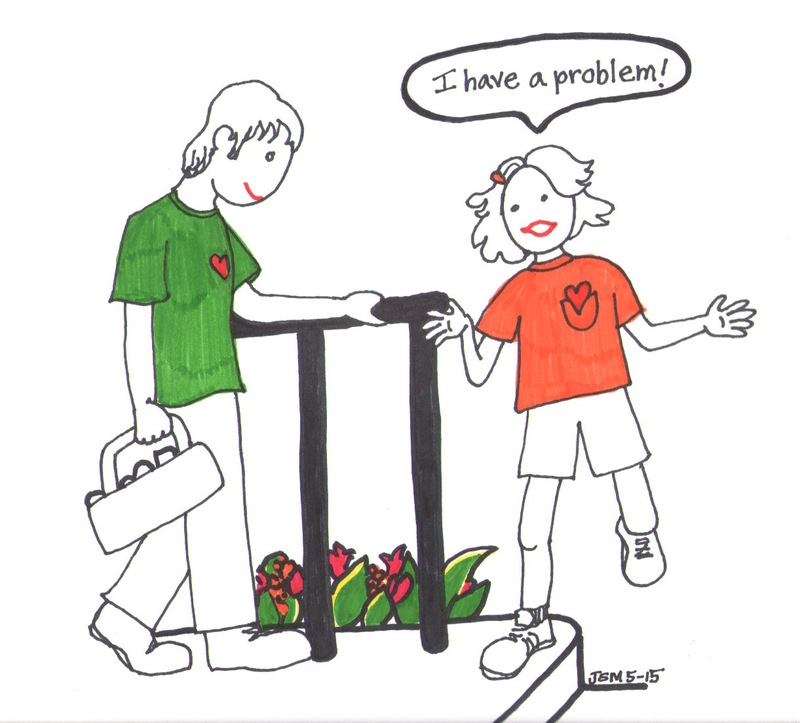 There are ways parents can promote inclusion at home and certainly not accept exclusion. In addition, check out Edutopia’s article on creating a culture of up-standers in schools. Remember the classic 1980’s film, “Back to the Future” when Calvin’s Dad confronted his bully, Biff and it forever changed the power dynamic in their relationship? And recall my story? I didn’t have to deal with the girl of many mean words again. When kids respond clearly and firmly, it has the power to completely shift the relationship. The message is “I’m not going to be picked on anymore.” And because the bullying behavior is a tentative ploy for dominance from a hurting child, he/she is likely to back off. The power has shifted and their ability to maintain control is on unsteady ground. Though the aim of bullying behaviors is to force us into feelings of helplessness, we are not helpless. Everyone in a community can take responsibility and serve a role. By doing your part, we can eliminate the threat of abuse and focus on learning together. Bazelon, Emily. (2013). Sticks and Stones: Defeating the Culture of Bullying and Rediscovering the Power of Character and Empathy. NY: Random House. Goldman, Carrie (2012). Bullied. What Every Parent, Teacher and Kid Needs To Know about Ending the Cycle of Fear. NY: Harper Collins. 1. Limber, S. P., Olweus, D., & Wang, W. (November, 2012). What we are learning about bullying: trends in bullying over 5 years. Paper presented at the meeting of the International Bullying Prevention Association. Kansas City, MO. 2. Duncan, Renae D. (2009) Family characteristics of children involved In bullying. Retrieved from education.com on 10-1-15. 3. Ttofi, M. M., & Farrington, D. P. (2009). What works in preventing bullying: Effective elements of anti-bullying programs. Journal of Aggression, Conflict and Peace Research, 1(1), 13–24. 4. CASEL, AIR, EDC. Social and Emotional Learning and Bullying Prevention. Online Guide.